Soon after seeing this film, I just kind of blurted out what this film meant to me when talking to fellow critics. It may be premature to declare it as such, but what the hell: Nightcrawler is my Network. Sidney Lumet's 1976 film is a scathing commentary on the news business, but it's also mildly preposterous. As a film it's magnificent, with some stunning performances, but there's a heightened theatricality to the work, an operatic quality about being mad as hell that's infectious while at the same time implausible. Nightcrawler, on the other hand, is both scathing and entirely plausible, all wrapped up in an entertaining film. An examination of the moral morass of the modern media landscape, as well as a dissertation on the role of ethics versus legality, this is a deeply thoughtful film that plays as a regular action romp, with some stellar car chases and moments of great suspense and intrigue. It's a modern masterpiece about media and obsession, and it left me shaking in my seat with excitement at what I'd just experienced. It's a testament to Dan Gilroy's taut script and impeccable direction that everything is done with pitch perfect consistency. This may be Gilroy's directorial debut, but his family pedigree for smart action is impeccable; his brother Tony scripted all four Bourne films (Dan contributed to The Bourne Legacy), and his twin brother Tony cut Nightcrawler, as well as films like Pacific Rim. Dan is married to Rene Russo, one of the highlights of this film, and his father Frank was a writer/director in Hollywood for several decades. The title refers to the species of journalist that probes the streets of Los Angeles looking for violence. A new kind of vigilante, they act like some comic book hero, but rather than a super villain they're on the lookout for the right shot, the juicy, bloody crime scene or accident victim that can then be sold to feed the fodder of local news broadcasting. This is the cutthroat intersection of paparazzi and prostitute, with the payback not sexual but violent or tragic. These creatures are paid for what they exploit, trolling the night on the lookout for the best shot. There are loads of other films that share similar deep examinations of lonely men doing dastardly things and benefiting from their questionable morals. There are allusions in this film to Taxi Driver, with a particularly violent mirror scene being one overt connection, but more so in the way that the mix of horror and reward culminate in a supremely black film that's still at times something approaching comedic. One can also sense a smidgen of what David Cronenberg's Crash dealt with, both in terms of the voyeurism of the violence as well as the normalization of our fascination with bodily violence. Nightcrawler gives us Jake Gyllenhaal's Travis Bickle moment, that film where his talents are fully solidified. The film rests on his twitchy performance, and his bug-eyed take as Lou Bloom is one of his best, very likely to see attention at awards time. His scenes with Rene Russo are electric, their psychological gamesmanship simply stellar. Bill Paxton's small role is effective and memorable, and Riz Ahmed as Rick makes for a great intern to Bloom. Only Kevin Rahm's role seems underwritten; his performance is fine, but his waffling morality doesn't come to much, and it's mostly a distraction. Sometimes films are made better by what they don't do. There's a scene late in the film where the genre convention might pull our character to go one step too far and extinguish his problems explicitly, making him overtly the "bad guy." The film wisely doesn't take this route, instead leaving a kind of ambulant respect for this character, one whose choices are always both premeditated and perfectly in keeping with the rules by which this kind of work demands. Things are awful without the need to go arch, and this manages to make the film even more powerful. Bloom's behaviour is questionable, certainly, and he does things that by the letter of the law are not appropriate, but for both journalistic and economic reasons it's a path that's perfectly in keeping with his own edicts for success, making the finale even more chillingly plausible. Bloom is a sociopath, but he's not a mindless one. Through rhetorical gymnastics honed through autodidactic obsessions, we have a character that's truly the product of the Wiki mindset, one able to synthesise from various power plays the course of action that will best benefit him. This is what makes the film so powerful and so memorable, that in Bloom we have someone outsmarting both his colleagues and the audience, making us root for him by the end despite all evidence to the contrary. The film is shot beautifully; the brilliant cinematographer Robert Elswit lenses L.A. as a mix of noir clichés and dyspeptic streetscapes. The car chases and other action sequences are intricately assembled, and the use of the glossy car with the lights flashing over the curvature as it races through the streets hearkens to the best of Michael Mann. 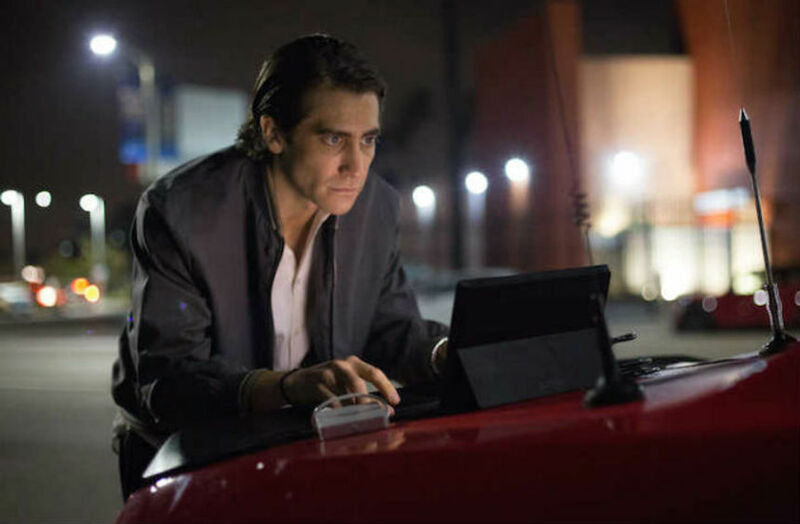 Deeply philosophical while remaining both captivating and entertaining, Nightcrawler is that rare breed of worm, one with an art-film heart and a Hollywood shine. It may be too dark and challenging for some, too dry and calculating for others. For me, however, this is the kind of thing I adore, something both caustic and cerebral, a wonderfully subtle film with moments of kinetic brashness. Combining brilliant performances, impeccable execution, and a laudable directorial debut, Nightcrawler is easily one of this year's best films. Review originally published during the Toronto International Film Festival in September 2014. The film will have special screenings tonight and then opens in theatres across North America on Friday, October 31. Visit the official Facebook page for more information. Hey Australia! "Buy The Ticket" And Win NIGHTCRAWLER On DVD! Hey Hong Kong! Win Tickets To See NIGHTCRAWLER Before It Opens!